The most elusive shoe, ever. Okay, Cynthia Vincent for Target. I give up. I've gone to every single Target store in the greater Austin area to try to find your gladiator wedges. I was willing to compromise. I'm a size 9.5 but was willing to squeeze into a 9 or slip slide in a 10. I pine for the cognac pair, but I would have been happy with the yellow or the black, too. Alas, I have not seen hide nor hair of these elusive shoes, except for on a woman at my church. And let me tell you, they were fabulous. It was all I could do to not tackle her and pry them off and run away like a banshee, never to return again! I had to pray for good behavior! Thou shalt not covet another woman's shoes! I called my best friend in California and had her scour her Target stores there. I looked online every single day, crossing my fingers for a return. Every time I went to my Target, I did a beeline for the shoe section, hoping against all hope that the stock for the Cynthia Vincent for Target gladiator wedges had been replenished. Nada. Zip. Zero. Not one single yellow box signaling my victory. At $30, they are exactly the same price. They aren't the wedges of my dreams, but at least my hunt for the perfect summer shoe won't end fruitlessly (unlike The Great Boot Hunt of 2009). Lately, I'm feeling a little like Kalteen Bar consuming Regina George. I'm gaining weight like crazy, so I find myself longing for new, cute shoes. Cute shoes are all that fits me right now! I'm a woman possessed! I must have cognac wedges! 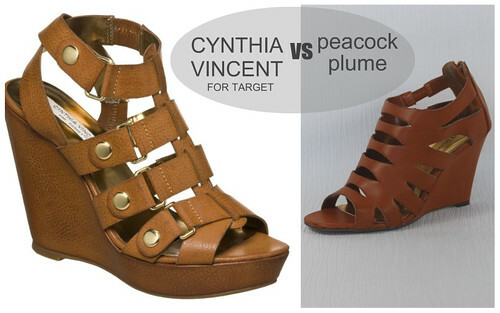 I'm beginning to think the Cynthia Vincent for Target ones are an urban shoe myth. EXCITING UPDATE [1 June 2010]: My new Austin friend Sydney (who I met at the last Ladies who Lunch event) bought my dream shoes one size too big for her... in a 9.5. She thought she'd try to make them work, but they didn't, so she is graciously selling them to me at cost-- new in box, never been worn! I am the luckiest lady, ever! They may come home to me as soon as Thursday, June 3rd!